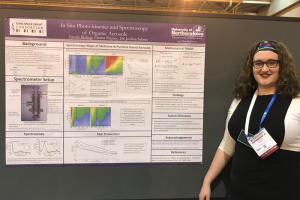 Nicole Bishop, an undergraduate chemistry major at University of Northern Iowa who has had personal research supported by an Iowa Space Grant Consortium Research Fellowship, was recently featured in a news story on the UNI STEM web site. It details her research work with the NASA Cassini mission, which collected data about the chemical composition of the atmosphere of Titan, the largest moon of Saturn. Read the full story here, or to access that story and similar ones, see the STEM Beat page on the UNI web site here.